The Nikon D3400 is an update to Nikon's entry-level DSLR, replacing the two year old D3300. The headline new feature is SnapBridge - Nikon's low-power Bluetooth connection that allows continuous image transfer to your smartphone in the background while you shoot. Battery life has been boosted to an impressive 1200 shots on a full charge and the kit lens has also been updated with quicker and quieter continuous AF for movies and Live view shooting. SnapBridge will ensure that the D3400 continues to be a popular choice for improving photographers who want a camera that’s more capable than a point-and-shoot compact or a phone, but don’t want to sacrifice the ease of sharing that those devices provide. Beyond that, there’s not a huge amount that’s new here over the D3300 and indeed a couple of features actually missing: the 3.5mm microphone input and ultrasonic anti-dust filter, no longer present on the D3400. Ultimately mirrorless cameras offer more features – not to mention greater portability – at this end of the market, but there’s no denying the D3400 offers one of the least expensive routes to a body with an APSC sensor, optical viewfinder and interchangeable lenses. As such it’ll continue to attract beginners and students, while the addition of SnapBridge means you’ll be sharing images quicker and more easily than most rival cameras. Check prices on the Nikon D3400 at Amazon, B&H, Adorama, or Wex. Alternatively get yourself a copy of my In Camera book or treat me to a coffee! Thanks! The D3400 is Nikon’s latest entry-level DSLR. Announced in August 2016, it comes two and a half years after the best-selling D3300 and like that model is aimed at beginners or those looking for a step-up in quality and control over a point-and-shoot camera without breaking the bank. Externally the D3400 body is essentially the same as its predecessor and typically sold in a bundle with the Nikkor AF-P 18-55mm f3.5-5.6G VR kit zoom, which has been updated over the earlier G VR II to offer faster and quieter continuous AF for movies. As before, the kit lens sports a collapsing design employed by many mirrorless kit lenses, allowing it to retract to a shorter length when not in use. Inside, the D3400 features the same 24 Megapixel APS-C CMOS sensor as before which lacks a low-pass filter for potentially crisper results and which is also capable of filming 1080 video up to 60p, although sadly the mic input of the earlier D3300 is no longer present. The viewfinder spec, 11-point AF system and 5fps continuous shooting are also inherited from the D3300. The big new feature is Nikon’s SnapBridge technology which exploits Bluetooth to maintain a low-power wireless link with smartphones. This allows the camera to automatically tag images with the phone’s GPS position and or copy them onto your phone without intervention if desired, so they’re ready to share straightaway. Unlike the higher-end D500, there’s no Wifi on the D3400 though, so no chance to wirelessly remote control the camera or transfer movies. Nikon’s also claiming an increased battery life up to 1200 shots per charge, thanks to the optical viewfinder – a key advantage of a traditional DSLR over a mirrorless camera. In my review I’ve compared the D3400 with Canon’s entry level DSLR the EOS 1300T / Rebel T6. If you’re in the market for a budget DSLR it’s likely to be one or the other you’ll be spending your money on. Alternatively, if you’re thinking a mirrorless compact system camera might be the way to go, I’ll also make comparisons with Sony’s A5100 and the Panasonic Lumix G7, both of which are similarly priced. The Nikon D3400 is, as far as I can tell, identical in appearance to its predecessor. The body is the same size, shape and weight and all the physical controls are the same. For the record, the D3400 measures 124 x 98 x 75.5mm. With the battery and a card fitted it weighs 445 grams; add the 18-55mm kit lens and the weight totals 590g. The Canon EOS 1300D / T6 looks about the same size and the measurements confirm it – 129 x 101.3 x 77.6mm. but it’s a fair bit weightier at 485g for the body including battery and a card and 685g with its 18-55mm kit lens. That extra 100g on the EOS 1300D / T6 suggests a slightly more robust construction, though both plastic bodies feel equally well engineered. I wouldn’t fret too much over the weight difference, I’ve carried them both around for several hours while out shooting and in practice there’s very little to choose between them in terms of comfort and handling. The differences are much more apparent when you compare the D3400 with a mirrorless system camera like the Sony A5100 or the Lumix G7. The A5100 body measures 110x63x35.7mm and weighs 283g with the battery and a card. The kit zoom brings the overall weight to 400 grams. That’s nearly 200g, or around seven ounces lighter than the D3400. What’s more, the SELP1650 16-50mm f3.5-5.6 Power Zoom kit lens on the A5100 adds a mere 30mm to the depth of the body when powered down and in its retracted position. That makes it much more compact than either of the DSLR’s as well as significantly lighter. Unlike the screen-only Sony A5100 the Panasonic Lumix G7 has a built-in electronic viewfinder and its styling as well as its size and weight are closer to the DSLRs. It measures 125x86x77mm and weighs 410g with the battery and a card. With the lens added the overall weight is 575g. Those figures underplay the compactness of the G7 compared with the D3400 though. Yes it’s just as wide, but it’s 12mm shorter and the depth is mostly due to the grip extending forwards and the viewfinder which extends rearwards. There’s actually a lot less of it than the D3400. Moving on from the size comparisons, there are a few physical differences between the Nikon D3400 and Canon EOS 1300D / T6 which I’ll cover briefly before talking about the D3400’s kit lens. In terms of control layout the D3400 and 1300D / T6 actually have quite a lot in common and where there are differences they’re not major ones. For example the control dial, used for making changes to exposure in some modes as well as menu selection, is located on the rear of the Nikon D3400 and is thumb-operated, whereas on the Canon 1300D / T6 it’s just behind the shutter release and index finger-operated. The control layout on the rear panel of the D3400 features a row of five buttons – playback, menu, zoom in, zoom out and information edit. The zoom out button doubles up as a help display button and the information edit ‘i’ button allows you to change settings on the information display. I’ll talk about how that works in more detail a little later. On the right side of the screen the four-way controller is flanked top and bottom by the Live view and drive mode buttons plus a delete button. By contrast, the Canon 1300D / T6 positions the screen on the left edge of the rear panel; that, and the front positioned control dial, leaves space for a nice big thumb rest with playback zoom buttons on the shoulder above and to the right of it. Another difference is that the Canon 1300D / T6’s four-way controller buttons do double duty as ISO, AF mode, white balance and drive mode buttons. The Nikon D3400 has a separate SD card compartment on the right side of the body with the battery compartment in the grip accessed from a door in the base. That means you can swap cards when the camera is mounted on a tripod, something that’s not so easily done on the Canon 1300D / T6 with its combined card and battery compartment. The Nikon D3400 has another advantage, battery life has been given a huge boost; Nikon claims the EN-EL14a battery is good for 1200 shots on a full charge – up from 700 shots from the same battery on the D3300. It’s worth mentioning that if you own an earlier Nikon DSLR, including the D3200, D3100, D5100, D5200 and P7700, you can enjoy a boost in battery life by fitting an EN-EL14a battery and upgrading your camera’s firmware. You can find details here. Another thing I should point out is mirrorless models like the Panasonic Lumix G7 and Sony A5100 come off quite poorly for battery life compared with DSLRs thanks to operating in Live View all of the time. The Lumix G7 will give you 360 shots on a full charge and the Sony A5100 400 shots. Of all four models I’ve mentioned, only the Sony A5100 allows in-camera charging via the USB port. The D3400 retains the 4:3 shaped 3in 1040k pixel screen of its predecessor which is broadly comparable with the 3in 920k pixel screen on the Canon 1300D / T6. While you can shoot in Live View on these cameras, I reckon most owners will compose their stills using the optical viewfinders. That’s not the case with the Sony A5100 which lacks a viewfinder of any description so the screen plays a much more central role. While the A5100’s 3in 940k pixel screen is similar in size and resolution to the DSLR’s here, there are a number of things that set it apart. 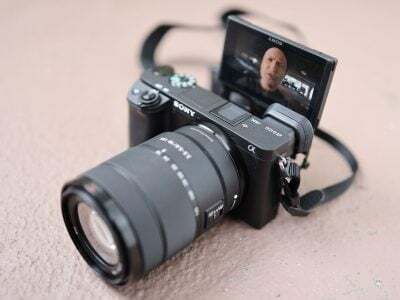 Firstly the Sony A5100’s screen is touch-sensitive, which means that as well as using it for limited access to the menu system you can tap the screen to focus on an object both for stills and movie shooting. The other major difference is that the A5100’s screen is articulated and can be flipped up (but not down) and over to face forward for selfies. Finally, its 16:9 proportions are ideal for movie shooting with an image area that fills the screen, but native 3:2 proportioned stills have black bands on either side. With the Panasonic Lumix G7 you get the best of both worlds with a touch-sensitive 1040k pixel side-hinged screen that can face any direction and an excellent high resolution 2360 dot electronic viewfinder. The G7’s electronic viewfinder is bigger than the optical pentamirror viewfinders in the Nikon D3400 or Canon 1300D / T6 and can also be used to film movies, playback images and preview effects, but electronic viewfinders aren’t to everyone’s taste, so the only way you’ll know for sure is to try one out. The Nikon D3400 shares the same viewfinder specification as its predecessors: a penta-mirror system delivering 95% coverage and 0.8x magnification. It’s nice and bright and provides a comparable view to other penta-mirror equipped DSLRs. A side-by-side comparison revealed that the D3400 viewfinder is marginally bigger than the 1300D / T6’s, (which has the same 95% and 0.8x specification, but a fractionally smaller sensor with a 1.6x field-reduction versus 1.5x). Like its predecessor, the D3400 has a built-in flash as well as a hot-shoe for an external unit. The built-in flash is a newer, lower power unit than in the D3300. The earlier model had a Guide Number of 12 (in Metres at 100 ISO) whereas the new unit in the D3400 has a Guide Number of only 8, making it slightly less powerful than the built-in flash on the Canon 1300D / T6, which has a Guide Nubmer of 9.2. In terms of ports, the D3400 is equipped with USB and HDMI. Interestingly the mic input of the earlier D3300 is no longer present, although I suspect not many people used it. This is in line with the EOS 1300D / T6 which also lacks a mic input. Meanwhile Sony’s A5100 has no mic input, but the Lumix G7 does. The D3400’s F-mount can accommodate most Nikkor lenses, with the DX-format sensor resulting in a 1.5x field reduction – so the effective range of the 18-55mm kit lens becomes 27-83mm. Strangely Nikon has dispensed with the ultrasonic wave filter of previous models to shake small dust particles from the sensor, presumably assuming most owners will rarely swap lenses. Its absence is not a huge deal though, just take additional care when changing lenses and invest in a rocket blower to scoosh away any persistent dusty offenders. As before, only recent lenses (i.e. type G, D, AF-S, AF-P, AF-I) will support the full focssing and metering modes. Like its predecessor, the D3400 doesn’t have a built-in AF motor so older lenses can only be used with manual focus. If you want to know if you can use your older Nikkor lenses with the D3400 there’s a full compatibility chart in the manual. Given the market for the D3400 it’s more likely that buyers will stick with the kit lens or buy new AF-S / AF-P lenses and the range is constantly growing with recent additions including a raft of f1.8 primes: the Nikkor 28mm f1.8G, Nikkor 50mm f1.8G and Nikkor 85mm f1.8G. The 50mm is particularly good as a portrait lens for the D3400 as the field-reduction turns it into a 75mm equivalent – see Thomas’s Nikon AF-S 50mm f1.8G review for more details. The D3400 is typically sold in a kit with the new AF-P Nikkor DX 18-55mm f3.5-5.6 G VR lens. This shares the collapsible design of the previous AF-S 18-55mm VR II kit zoom supplied with the D3300, but now sports improved continuous AF performance when shooting movies and stills in Live view mode. To extend the lens for use you press the button and twist the zoom ring clockwise past a latch to the zoom section. To collapse it again you press the lock button and twist it back. In the collapsed position the lens is 63mm long, extending to 90mm in the 18mm position. So by collapsing the lens you’re making it 27mm shorter. It’s not a massive reduction, but it does make a difference if you’ve got a small camera bag full of other kit. 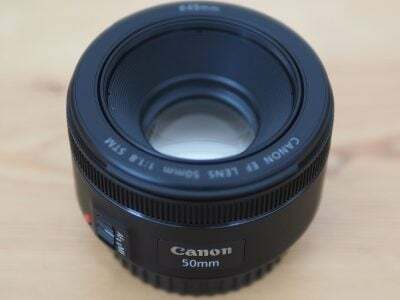 The Canon 1300D / T6’s EF-S 18-55mm IS II kit lens is only 80mm long at the 18mm wide angle setting and if you zoom in slightly to around the 30mm mark it shrinks to 70mm, but it has a larger diameter than the Nikon kit lens and looks altogether chunkier. When you’re carrying the D3400 around it’s not really worth collapsing though. For one thing, you might miss a shot while fumbling for the lock button to extend the lens. I also found that was too easy to accidentally press the button and inadvertently retract the lens when zooming out during movie recording, which prematurely ends the recording. I don’t see why Nikon didn’t go for a similar system to that used on the Olympus Micro Four Thirds 14-42mm zoom, which only requires you to slide the latch to return the lens to its collapsed state, not to extend it, but there you are. 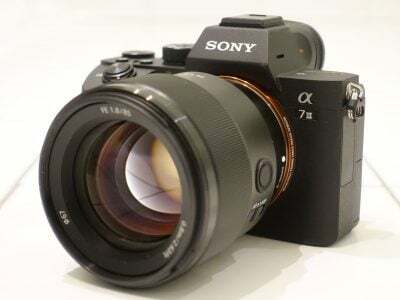 Of course if you’re looking for compact lenses, the Lumix G7 and Sony A5100 do much better – the absence of a mirror and the shorter distance from the lens mount to the sensor makes for much more compact lens construction. 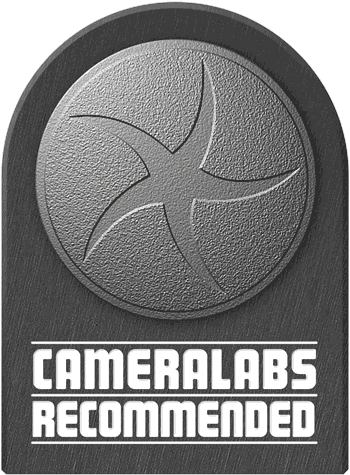 You can see my comparison of kit lens sizes and weights near the beginning of my review. It’s also worth bearing in mind that if you plan on adding more lenses to your kit, the overall weight of a mirrorless kit bag will be significantly less than that of a corresponding DSLR kit. The VR at the end stands for Vibration Reduction, Nikon’s lens-based image stabilisation system. The D3400 body has no built-in stabilisation so whether or not you have this feature depends on the lens you use. To test the effectiveness of the 18-55mm kit lens’s VR stabilisation on the D3400 I zoomed it to its maximum 83mm equivalent telephoto focal length and took a sequence of shots in Shutter priority mode at progressively slower shutter speeds first with stabilisation off and then turned on. As you can see from the 100 percent crops below the Optical Vibration Reduction system is capable of eliminating camera shake down to 1/10th – about three stops slower than conventional wisdom suggests. The Nikon D3400’s video modes are inherited unchanged from its predecessor, the D3300. Essentially the only change to its video capabilities (aside from the lens update) is a retrograde one, the external stereo mic socket having been dropped, leaving the internal mono mic as the only means to record sound for movies. While it’s always a shame to lose a feature, I suspect not many owners will miss it, but if you do want higher quality audio with movies you can always use a seperate sound recorder. The full range of PAL video modes are 1080p50, 1080p25, 1080p24 720p50 and 640×424 at 25fps. For NTSC the 50 and 25fps rates switch to 60 and 30 with the exception of the 1080p24 mode which remains at a film-like 24fps. There are two quality settings, Normal and High. Depending on the footage, at the best quality High 1080p60 setting a 10 Minute clip will take up around 2GB and that’s the longest you can shoot with the D3400 in its 1080p60 High quality mode, though if you reduce the quality to Normal that extends to 20 minutes. As before clips are saved in QuickTime format using the same H.264 codec. The Canon 1300D / T6 lacks a 1080p 50/60 mode, it’s best quality setting is 1080p 30/25/24. You can shoot at any of those settings until you fill the memory card though, plus the 1300D / T6 offers full manual exposure control for movies, but no continuous AF. Like the Canon 1300D / T6 The D3400 doesn’t have a movie shooting position on the mode dial, you must first put the camera into Live view mode before pressing the movie record button. The D3400’s display remains in 3:2 mode until you press the record button. Pressing the info button switches to the ‘Show movie indicators’ overlay which places a dimmed letterbox with a window in the centre of the screen showing the 16:9 movie area as well as displaying the movie mode, time remaining and audio level indicator. The D3400 sets the shutter speed, aperture and ISO sensitivity automatically for movie shooting, but setting manual movie settings to On in the Shooting menu allows setting of the shutter speed and ISO when the mode dial is set to the M position. You can even adjust the shutter speed and ISO during filming so long as you’re happy to put up with the clicking of the command dial which is easily picked up by the built-in mic. What you still can’t do though is change the aperture for the movie mode – as before, the movie mode inherits the aperture value from Live View, so the best you can do is preset the aperture before entering Live View, then start the movie mode. While this falls short of the complete Manual exposure control available on the EOS 1300D / T6, it’s probably enough for most people. The D3400 offers continuous AF during movie recording. On earlier models this feature was marred by frantic continuous focussing adjustment which was not only visually distracting but audibly noisy thanks to the lens motors. However I’m pleased to report Nikon has made substantial improvements with the new AF-P DX 18-55mm f3.5-5.6 G VR Kit lens and continuous focussing is greatly improved. With this lens, the continuous AF is more confident, less noisy and a real benefit worth making use of when shooting movies. The EOS T6 / 1300D has no continuous autofocus mode for movies. However, if continuous AF for movies is a priority for you the Sony A5100 and the Lumix G7, both of which have continuous AF and the ability to focus using their touch screens, make a much better job of it than the D3400, improved though it may be. The A5100 in particular is very good at continuous AF thanks to its embedded phase-detect AF points on the sensor being better at knowing which direction to focus the lens and when to stop turning. But it’s not only continuous AF where mirrorless rivals can outdo the D3400. The Lumix G7 offers 4k UHD capture, full control over exposure, silent screen-based adjustments, flat profiles, an external mic socket, focus peaking and zebra patterns. And in addition to very effective hybrid AF for continuous autofocus for movies, the Sony A5100 provides multiple encoding options for 1080 / 25/30p and 1080 / 50/60p at high bit rates using the XAVC S format. In short, if you’re into movies, you’ll enjoy greater performance and quality from a mirrorless model at this price point. Now here’s some samples showing the D3400’s movie mode in practice. This clip, like the others below was shot in the Nikon D3400’s 1080/50p mode with stabilisation enabled and continuous autofocus. The AF is a little jumpy, but much more settled than with the previous version of the kit lens on the D3300; and when the focus is adjusted you can’t hear a thing from the new AF motors. For this second clip the camera was mounted on a tripod and the stabilisation was disabled. I shot this scene both in single and continuous AF modes and though the single AF clip was the better of the two I’ve shown the continuous AF one here because it shows how much of an improvement the updated lens makes. At the beginning of the clip the scene is out of focus because I forgot to half press the shutter to activate the AF. While the camera is stationery nothing happens but as soon as it starts to pan the AF quickly brings things into focus. During the pan and zoom there’s a little bit of refocusing, but nothing too intrusive. The quality of this interior low light panning clip is very nice, the white balance is good and the D3400 does a good job with the changing lighting conditions. But in low light the Continuous AFis a lot less sure and there’s a fair bit of hunting about as objects at various distances from the camera enter and leave the frame. Of course, for a scene like this there’s always the option of single AF. For this clip I tested the D3400’s continuous AF performance by zooming the lens in slightly and panning from the coffee cup on the table up to the armchair and back again. There’s a little bit of hunting, but this isn’t a bad perfomance at all and definitely a big improvement on the earlier kit lens. The D3400 is essentially the D3300 with Nikon’s recently introduced SnapBridge bluetooth connectivity, so I’ll start with that. Bluetooth allows the D3400 to maintain a low-power wireless link with your smartphone at all times, allowing it to embed GPS positions or watermarks on images as you take them, while also trickling photos from the camera to phone, all without intervention – even when the camera’s switched off if desired. Bluetooth may be technically slower than Wifi, but by tagging, watermarking and or copying images without intervention, it invariably gets the job done quicker as there’s no need to pause and manually initiate the process. It’s an interesting choice too as most of the D3400’s rivals have Wifi built-in, allowing them to not only wirelessly transfer images and in some cases sync GPS logs, but also wirelessly remote control the camera. Without Wifi built-in, the D3400 misses out on wireless remote control with a smartphone, but the question is whether anyone will miss the capability on this kind of camera? After all, the primary use for wireless connectivity at this end of the market is image transfer for sharing, and as you’ll discover, the SnapBridge Bluetooth approach makes it virtually seamless. To use SnapBridge you first need to download the SnapBridge app to your phone, I tested it on my iPhone 6. When you launch the app it helps you pair the camera and your phone. If you have a phone with NFC, this simply involves holding the handset against the side of the camera for a couple of seconds before both devices display passcodes for you to confirm. Once confirmed, the phone and camera are connected by Bluetooth and you’ll never need to do it again. SnapBridge on the D3400 worked seamlessly in the background. I set it to automatically download my photos as I took them, opting for the reduced 2 Megapixel size partly for speed but also to save space on my phone. If preferred you can manually select which images you’d like to copy, and there’s also the chance to transfer originals, although beware their larger file sizes will understandably take longer to copy across and also consume more storage on your phone. You can also opt to upload your photos to the Nikon Image Space service and I can see that this might be useful as a backup or if you wanted to share full-size JPEGs on from there. In fact the only thing you do have to worry about is battery life. Although the Bluetooth connection uses less power then Wifi, the D3400’s battery drains more quickly with Snapbridge enabled and downloading images in the background like this. Helpfully, though, it does send a notification to your phone to tell you when the battery level is down to 20 percent. Either way, having your shots immediately accessible on your phone makes sharing to social networks about as simple as if you’d taken the shots on your phone in the first place. The only drawback is you might not want everything you shoot on your phone, but five minutes spent culling the unwanted images easily takes care of that – and again you can choose to manually tag specific images for transfer if you don’t want all of them queued. Time taken for 2 Megapixel images to be automatically transferred from the camera to your phone is a little variable and in my experience could be anything from a few seconds to nearly a minute, longer if there’s a queue of images to be transferred. That said, even if you’re staring at your phone screen waiting for the image to transfer, that’s not too bad and it’s more likely you’ll review a batch of photos a short while after you’ve shot them, in which case it doesn’t matter. The bluetooth link between the camera and your phone is maintained when you switch the camera off, so any remaining downloads can complete and to save time connecting when you turn the camera back on again. If you want to minimise the demands on the D3400’s battery you can turn this setting off. What does matter is that even if you don’t plan to share your photos from your phone, it’s a much better way to review them than the D3400’s screen. As noted above, you don’t have to automatically download eveything you shoot to your phone. You can turn off auto download and use the app to review the images on the camera’s card, selecting only those you want. Again you get the same 2 Megapixel or full size options. This isn’t nearly so convenient though. If there are a lot of images on the card it can take a long while (around a minute for a card with 200 images in JPEG + RAW formats) for the app to display the thumbnails on your phone. The other thing is if you leave the app (for example to view notifications) it has to go through the whole time-consuming process of downloading thunbnails again. The thumbnails are displayed at phone screen resolution, so though you can enlarge them you don’t see more detail. The communication works both ways as the phone can also be configured to send its GPS position to the camera for instant location embedding as you take photos. The location is embedded in the photo on the camera’s memory card, and also on the version sent to the phone if it’s also tagged for transfer. Cleverly the app can additionally synchronise the camera’s clock with the one in the phone, which is particularly useful when you travel to different time zones – as soon as your phone updates its clock, the camera’s clock automatically follows suit. The app will also tell you if or when a firmware update is available. So overall the SnapBridge app provides a bit of a mixed user experience, but despite the rough edges and minor irritations, a generally good one. It’s undeniably cool to have immediate access to all your shots on your phone without having to do anything at all once it’s set up. Moving on, the D3400 inherits the same 11-point AF system as its predecessor which uses the Multicam 1000 module with a single cross-type sensor in the middle of the grid sensitive to -1EV. There are three main AF modes: AF-S (Single Servo AF), AF-C (Continuous Servo AF) and AF-A (an Auto mode which selects between them depending on whether the subject is in motion). These are selected from the main information display screen, where you’ll also be offered a Manual focusing option. Like the D3300 and D3200 before it, there’s four AF Area modes: Single Point, Auto Area, Dynamic Area, and 3D Tracking (the last two only available in AF-A and AF-C modes). In Single and Dynamic Area, you can manually adjust the focusing point using the rocker control, with Dynamic Area also considering surrounding focus points if the subject moves. The D3400 exclusively relies on contrast-based AF in Live View, with the choice of four modes: Normal Area, Wide Area, Face Priority and Subject Tracking. Also Inherited from the D3300 is the choice of AF-S (Single) or AF-F (Full-time Servo) in Live View, where the latter attempts to continuously autofocus, plus there’s also the option to focus manually in Live view. In practice the D3400’s viewfinder AF is swift and reliable, though less snappy than the higher end consumer models that are equipped with a larger number of AF points and cross-type sensors. In most situations the D3400’s AF was marginally faster than the Canon 1300D / T6. In Live View though it’s streets ahead of the Canon 1300D / T6, locking focus in a mere fraction of a second where the latter can often take several seconds given the same scene. The D3400 inherits the same 5fps continuous shooting mode as its predecessor. A button on the rear panel activates a menu with the continuous shooting mode alongside self timer and remote options. There’s only one 5fps mode with focus locked on the first frame but exposure metered between shots. To test the D3400’s continuous shooting I fitted it with a freshly formatted Sandisk Extreme Pro UHS-1 card. With the D3400 set to Large Fine JPEG mode and the shutter speed set to 1/500, I held the shutter down and the D3400 fired off around 70 frames at a regular rate which I timed at almost exactly 5fps. After that the rate became slower and a little erratic until the usual Nikon burst limit of 100 frames was reached. Set to RAW, I managed seven frames before the camera hiccupped, which corresponds to 4.1fps. In RAW mode the shooting rate becomes pretty erratic after the first few frames so you’re probably better off sticking with JPEGs for continuous shooting. The EOS 1300D / T6 is capable of continuous shooting more or less indefinitely at 3fps for large fine JPEGs or 6 RAW fles. But for reasonably fast continuous shooting with reliable AF, the mirrorless models are the way to go. The Lumix G7 offers 6fps with continuous AF and its 4k Photo mode effectively gives you 30fps at 8 Megapixel resolution. And the Sony A5100 boasts 6fps with its hybrid AF system delivering a high percentage of keepers. One thing that does work in the DSLRs’ favour where continuous shooting is concerned is their optical viewfinder which provides a continuous (with brief interruptions when the mirror flips up) view of your subject in real time, compared with the last frame view you get in an electronic viewfinder or on the screen on most mirrorless models. As you’d expect, the D3400 offers the full range of PASM exposure modes along with a wide range of scene modes and effects that can be applied at the time of shooting or in-camera afterwards. One disappointment is that it still lacks any form of auto exposure bracketing, an ommission that has long put Nikon’s entry-level DSLR at a disadvantage compared with Canon’s entry level DSLR and mirrorless models.